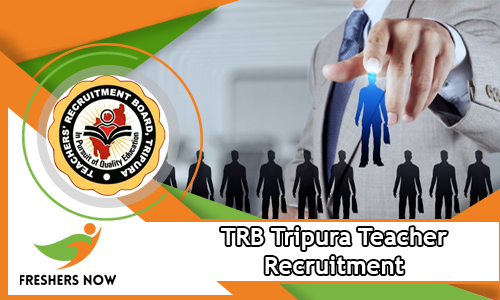 TRB Tripura Teacher Recruitment 2018 Notification is issued by the Officials of Teacher’s Recruitment Board Tripura. So, if you want to get the total details about this TRB Tripura Teacher Recruitment 2018, then check this entire post. Starting from 12th December 2018, the interested job searchers for can apply for the 3611 STGT, STPGT. Well, the closing date to submit the application form is 19th December 2018. And the officials will not consider your application form if you do not submit the application by the closing date. So, what are you waiting for? if you are looking for a Government Job and that too in Tripura state, then this chance is for you. Use it. Here in this section, we are going to provide brief information about the TRB Tripura Teacher Recruitment 2018. So, please check them all. And then apply for the trb.tripura.gov.in Openings 2018, before the closing date. We are also attaching the TRB Tripura Teacher Notification 2018, too. Check that, if you are having any doubts. Applicants need to complete their B.Ed and any graduation from any recognized institute or University in India, as the educational Qualification. Contenders who are intending to apply should have the maximum age of 40 years. For, age relaxation details check out the advertisement. First of all, Download the TRB Tripura Teacher Recruitment 2018 Notification from this article. Then if you are eligible, go to the official site of the Teacher’s Recruitment Board Tripura at trb.tripura.gov.in. From there go to the Employment Section. And Check for the Teacher Application Form. Like all the details we provided about the TRB Tripura Teacher Recruitment 2018 Notification? Get more such informative stuff, by checking our site Freshers Now, regularly. Teacher’s Recruitment Board has issued a TRB Tripura Teacher Recruitment 2018-2019. Therefore, we have arranged all the details about the TRB Tripura Teacher Notification 2018-2019 on this page. Moreover, the TRB Tripura officials are hiring the candidates for the 4262 TGT, PGT Vacancies. So, the applicants need to refer this page fully to get an idea about the TRB Tripura Teacher TGT, PGT Recruitment 2018-2019. And, the deadline for the registration process is 15th April 2018. So, we have provided all the information on this page related to the TRB Tripura Teacher Notification 2018-2019 for the sake of aspirants. In addition to this, contenders can find the Steps To Apply For The TRB Tripura Teacher Recruitment 2018-2019. And, we have also arranged the Educational Qualification, Salary, Selection Process, Application Fee details in the below sections. The aspirants who are waiting to apply for the TRB Tripura Teacher Recruitment 2018-2019 can refer this post to know the details. Furthermore, the application process for the TRB Tripura Teacher Notification 2018-2019 has started a few days back. Therefore, candidates need to apply quickly for the Teacher’s Recruitment Board Tripura Teacher Recruitment 2018-2019. Moreover, applicants need to once cross check all the fine points before applying for the TRB Tripura Teacher TGT, PGT Recruitment 2018-2019. In addition to this, contenders can find the TRB Tripura Teacher Recruitment 2018-2019 Notification at the bottom of this post. Hence, candidates can check more particulars in the official notification. Moreover, aspirants can check more Tripura Govt Jobs on our web portal. So, we have provided the link to check govt jobs on this page. All the aspirants need to apply for the TRB Tripura Teacher Recruitment 2018-2019 through online mode. Furthermore, contenders can check more points in the official notification. Moreover, we have provided the same particulars on this page related to the Teacher’s Recruitment Board Tripura Teacher Recruitment 2018-2019. Therefore, candidates before starting their application process need to refer this article to get all the details. In addition to this, the TRB Tripura will conduct the exam on 06th May 2018 for the applied candidates. Hence, aspirants need to start their preparation for the examination. In addition to this, we have attached some important dates to remember at the bottom of this post. Thus, the contenders can get an idea by referring this whole article. Moreover, we have also arranged the direct link to apply for the TRB Tripura Teacher TGT, PGT Recruitment 2018-2019 in the below sections of this page. Aspirants need to complete their B.Ed Degree from a recognized university to apply for the TRB Tripura Teacher Recruitment 2018-2019. Moreover, aspirants can refer the official notification to check the post wise educational details. Here we inform that the candidates who are interested to apply for the TRB Tripura Teacher Recruitment 2018-2019 need to pay the application fee. Moreover, we have arranged the particulars in detailed form in the below sections. And, the competitors need to be 40 Years to send their application for the TRB Tripura Teacher Notification 2018-2019. So, the candidates need to check all the particulars before starting their application process. Furthermore, we have gathered all the important points on this page related to the Teacher’s Recruitment Board Tripura Teacher Recruitment 2018-2019. Thus, we request the applicants to read this page overall to find all the information about the TRB Tripura Teacher TGT, PGT Recruitment 2018-2019. And, the competitors need to participate in the Written Test, Interview who are applied for the TRB Tripura Teacher Recruitment 2018-2019. Furthermore, the written test date has also announced which is mentioned in the above section. So, the aspirants need to start their preparation for the examination. In addition to this, we have also arranged the syllabus and previous papers for the test on our web portal. Thus, contenders can check and download for their practice. And, the TRB Tripura will pay the salary on monthly basis for the selected candidates. Hence, competitors need to check the below sections for the pay scale details. Furthermore, candidates can check more Recruitment, Syllabus, Previous Papers, Admit Cards and Result on our web portal. In addition to this, we have attached the link to our official website at the end of this post. Aspirants can check the official notification to get more details related to the age limit. Aspirants need to know the step-wise procedure to apply for the TRB Tripura Teacher Recruitment 2018-2019. So, contenders need more clarification about TRB Tripura Teacher Recruitment 2018-2019 can leave a comment in the below comment box. And, visit our website freshersnow.com to check more updates.